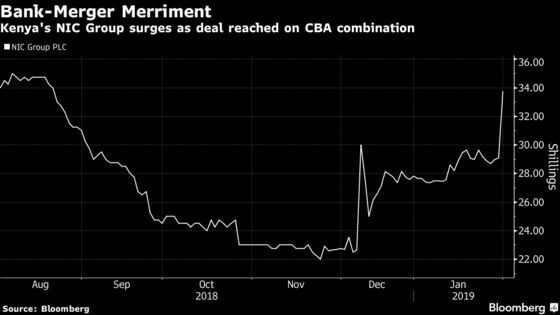 (Bloomberg) -- After agreeing to Kenya’s biggest banking merger in at least a decade, Commercial Bank of Africa Ltd. and NIC Group Plc, are ready to take on regional rivals that have outsized them until now. The combined entity will have assets of 415 billion shillings ($4.1 billion) -- about double what they each hold individually in the country -- catapulting it past Co-operative Bank of Kenya Ltd. as the East African nation’s third-largest lender. Shareholders in closely-held CBA will own 53 percent of the combined group after switching their equity for stock in NIC, which will become the holding company and retain its listing on the Nairobi exchange. The deal will boost earnings and revenue by leveraging NIC’s asset-financing capabilities with CBA’s digital-banking platform as well as their “relative strengths” in corporate banking, Nairobi-based Apex Africa Capital Ltd. said in an emailed note. The merged firm may “opt for more brick and mortar branches” to increase their nationwide presence, while improving their digital offering. CBA and NIC plan to complete the deal by the third quarter, which would be the biggest bank tie-up since Johannesburg-based Standard Bank Group Ltd. in 2007 started talks to buy CFC Bank Ltd. It will also be the first major transaction since the Central Bank of Kenya started pushing for consolidation in 2015, and could spur Kenya’s other lenders to consider mergers. The country has 43 banks, more per person than South Africa and Nigeria, Africa’s two largest economies. Kenya’s Treasury Secretary Henry Rotich said after NIC announced merger talks in December that the stronger bank would be able to make more credit available and take on rivals from West Africa that have made forays into the region. Guaranty Trust Bank Plc, Nigeria’s largest lender by market value, and United Bank for Africa Plc, its third-largest lender by revenue, have operations in East Africa. NIC’s shares jumped 20 percent to close at 34.80 shillings, the highest since Aug. 7. That extended gains since talks were announced in early December to 49 percent, giving NIC a market value of 23.8 billion shillings.